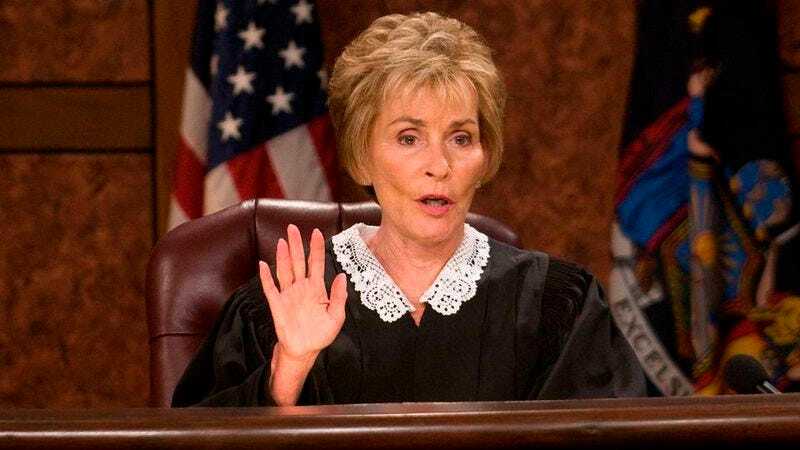 As reported by Variety, CBS is officially developing a TV series based on the life of Judy Sheindlin, better known as Judge Judy—from the TV show Judge Judy. This is in addition to the extensive contract Sheindlin already signed with the network that keeps her existing show on the air through 2020. The new series will be called Her Honor, and it’s being written by Chicago Justice showrunner Michael Chernuchin. Sheindlin herself is signed on as a “story co-writer,” which probably means she’ll mostly be offering up anecdotes about important life events that would make for good TV show episodes. Specifically, the plot will revolve around “the youngest judge in New York”—who is probably a woman named Judy—as she “cuts through the chaos in Family Court” even though she “can’t seem to maintain control of her own life outside the courtroom.” Hopefully there’ll also be a scene where someone pees on her leg and tells her it’s raining, revealing the origin of her classic catchphrase.